We make your home safe to live in again after a flood. We have the experience, expertise and equipment and we are in service to you 24/7. Flooding of any kind entering your Nampa home can be devastating, but flooding from sewer backup can be much worse. It happens when water is pushed into your residence from the drainage or sewer systems and is very unpleasant. It involves dirty water from sewers that not only destroys your personal property but can also impact the health of you and your family since it is unsanitary. When you have flood damage from sewer backup in your Nampa home, you need help right away. At SERVPRO, our staff is professionally trained remediation specialists who have the tools and experience to help you restore your home to the safe and cozy state it usually is. One cause of a sewage backup into your home is if the city main becomes blocked. A blockage like this can cause water to back up into your home through the pipes. Aging sewer systems which require repair or updates can also cause issues for you. Because of the nature of the water, SERVPRO techs must do a biohazard cleanup in your home, other than just regular flood water damage remediation. We always wear PPE or personal protective equipment to avoid contaminants in the water touching our eyes, skin, or mouth. Boots, gloves, splash goggles, full body suits, and respirators round out our protective gear. We have to remove any carpeting and padding which was affected, and depending on how much water there is we may need to cut away sections of drywall and walls that were soaked and contaminated. The whole area is also disinfected. Another reason for a sewage backup into your home can be tree roots which find their way into older sewer lines and pipes, creating blockages. You can check for this problem in your lines by having a plumber check your pipes and doing some preventative maintenance. Pipeline issues which are city-related such as combined pipelines or issues in the sanitary main can cause you problems in your own home. When the system you use combines the stormwater and sewage into one pipeline instead of separate lines for each, they are combined pipelines. Because of this, the system can get overwhelmed during a storm, backing the water up into your home. SERVPRO of Nampa/Caldwell can help you anytime you have a flooding situation in your home in Caldwell, Nampa, or the surrounding areas due to a sewage backup. It is not safe to try and clean it yourself, so please give us a call right away at (208) 466-5000, so we can help you. Nampa has events and attractions for every one click here for more details. Contact SERVPRO of Nampa / Caldwell at (208) 466-5000. There may be times as a commercial property manager when the breadth and scale of cleaning task go beyond your in-house janitorial team. Many businesses choose to outsource these jobs to a professional provider to guarantee a thorough, professional and timely service. We operate locally with a team of dedicated technicians who are experienced in dealing with larger commercial projects. The team is capable of carrying commercial cleaning in Nampa properties using a range of different cleaning agents and techniques. 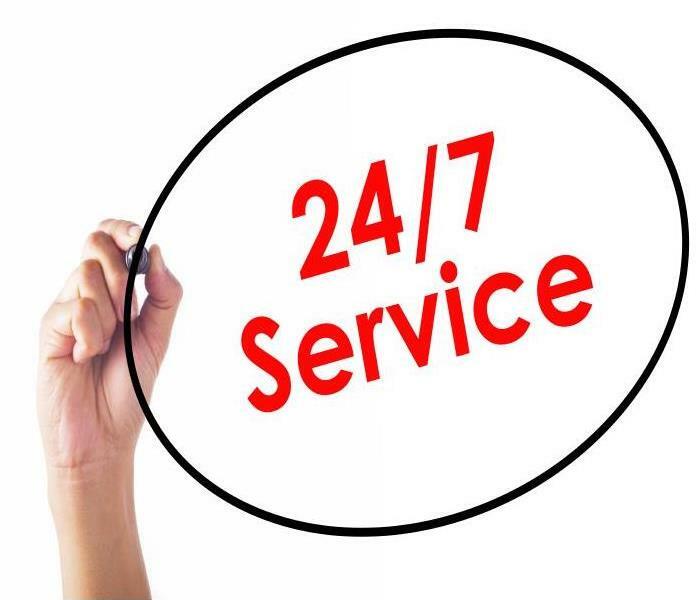 You can contact us using our twenty four hour line to request a service. Depending on the size of your property, we can then send you a team of professional cleaners headed by an experienced commercial project manager who communicates with you every step of the way. Over time, a property begins to show natural signs of wear and tear. These could include damages to paintwork, or the buildup of grime or bacteria in tight to reach areas. SERVPRO provides technicians with a full range of cleaning agents including biocides, sanitizers, and anti-microbial treatments. These not only remove residual dirt but can also guard against expensive secondary damages like mold growth. Working quickly to sanitize a property can also have a positive effect on odors. This is not always the case, but SERVPRO odor control technicians (OCT) are adept at finding the source of an odor and removing from the property. Once we have tackled the source, we can treat surfaces with deodorants and use thermal fogging equipment to neutralize any remaining particles. After fogging a structure, we can create an open system by allowing air from outside to be exchanged with indoor air. Using rapid air-movers can help to speed up the process creating a clean, natural indoor environment. Throughout service, your crew chief can create an itinerary of works carried out and answer any questions you may have. Professional cleaning is a time efficient solution for your commercial property. Contact SERVPRO of Nampa / Caldwell at (208) 466-5000. 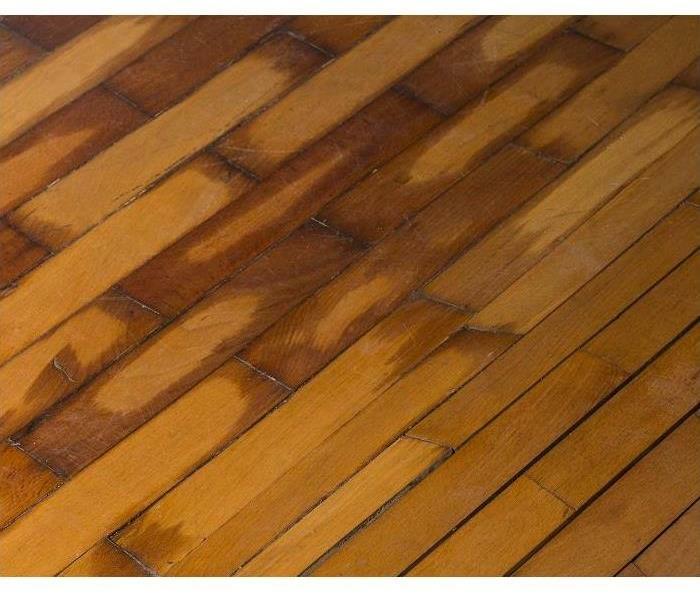 Hardwood and water do not mix. SERVPRO's trained professionals can mitigate the water damage. Hardwood floors present aesthetic appeal to your Nampa home, but it can also be susceptible to saturation and the absorption of water loss effects when they occur. From burst pipes to overflowing toilet reservoirs, these loss incidents can happen with no warning and leave you contending with several inches of standing water in the affected areas. With many homeowners choosing waterproof wood flooring materials for areas like their bathroom, they unknowingly assume that the material is impervious to penetration from standing water and exposure. While these waterproofed materials installed in your home might get designed to resist moisture and direct penetration better than other options, without effective water removal from trained professionals in Nampa, your home is still susceptible to widespread water damage. Our SERVPRO professionals have highly effective extraction equipment that can remove standing water fast from the affected areas of your home. Waterproof plank flooring does have a specific density, composition, and an added coating to prevent direct penetration from standing water. However, areas like the tongue and groove where these planks seam together present penetration points and vulnerabilities for the standing water to bleed through over a brief exposure. As the planks become exposed to this moisture, they can begin to distort and swell, allowing moisture to penetrate even further to impact the subflooring. Our SERVPRO professionals arrive with powerful extraction equipment for the bathroom such as portable sump pumps and wet-vacs with extraction wands. Once the excess gets removed, our team can utilize thermal imagery to gain perspective on moisture penetration and damage to the flooring and other structural elements surrounding the affected area. We can set up our high-efficiency drying equipment to begin removing this moisture content from exposed materials to preserve both the flooring and construction elements like your drywall, vanity, and cabinetry. While waterproof flooring in water-prone rooms of your home is a wise investment, they are not entirely able to prevent moisture exposure and damage without prompt action from trained professionals like our SERVPRO of Nampa / Caldwell team. Let us help you make it “Like it never even happened” by calling (208) 466-5000. Read more about Nampa here. Are Waterborne Pathogens A Concern After Water Removal In Nampa? Sometimes you need water removal in your home. All it takes is a broken appliance or a leaking pipe to cause a surprisingly large flood. Luckily SERVPRO is on hand to deal with the situation in your Nampa home quickly and professionally. Something our customers sometimes worry about when it comes to water removal in Nampa is whether they need to be concerned about waterborne pathogens. It is an unfortunate fact that water can carry a range of different pathogens. Some of the most common waterborne diseases include cholera, hepatitis, shigellosis, amebiasis, typhoid fever, and viral gastroenteritis. It is a hair raising list to be sure. Bacteria, viruses, and protozoa in water all cause diseases, and the conditions listed here have a range of highly unpleasant symptoms. However, do not panic quite yet. Outbreaks of waterborne diseases are relatively rare and are unlikely to happen as a result of your leaking pipe or broken dishwasher! 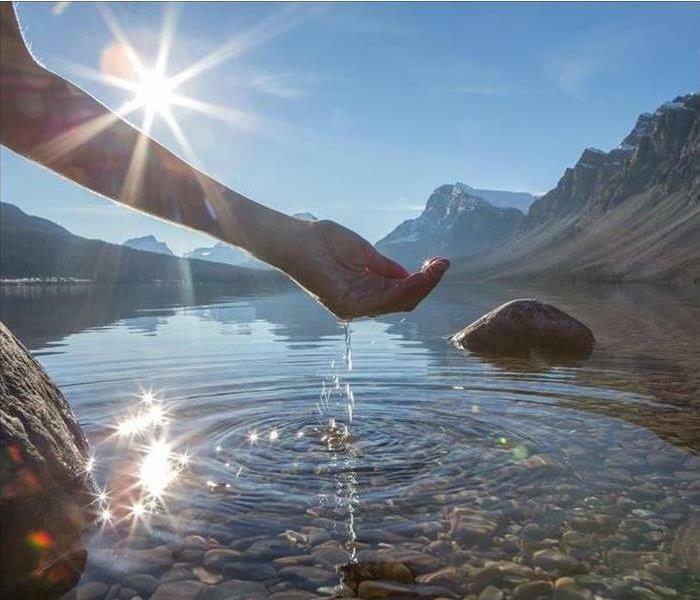 Most waterborne diseases are caught by drinking contaminated water – they are not transmitted through the skin. Therefore, even if there is a disease present in your water leak, it is unlikely to harm you. Water treatment plants also go to great lengths to ensure the water they deliver is safe for the purpose. Filters, flushing programs, and the use of disinfectants are all part of the effort to ensure the water piped to your home is safe for you and your family. So, it seems that waterborne pathogens are not an immediate risk after a leak in your home. Naturally, you still want to get the water removed as quickly as possible, just to be on the safe side and also to restore your home and make it habitable again. For water removal in Nampa / Caldwell and the surrounding areas, call SERVPRO of Nampa / Caldwell at (208) 466-5000 today. More about this beautiful area click here. Mold spores are common to every home in Nampa. In their dormant state, they are no more of a threat than common dust. It is only when the spores are affected by the right factors, do they become a problem in area homes. Nampa mold damage can only happen when spores have enough moisture to grow within a range of 68 to 86 degrees and find a suitable food source. SERVPRO understands that since that is the normal range for most homes year-round, the best way we can eliminate mold and remediate the damage is to remove the water that provides a starting point and the food source spores need to grow the colony further. Our primary task then is to find and eliminate the leak or another source of moisture. 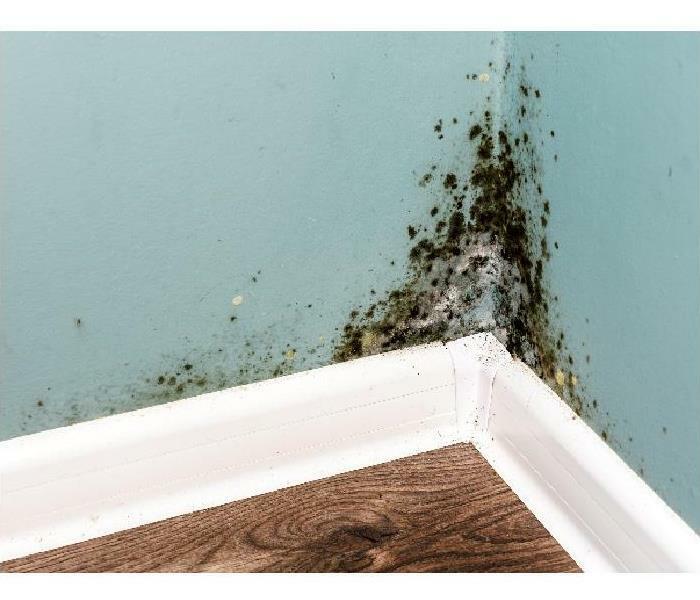 Most mold growth in a home begins due to a problem with a pipe or a faulty appliance that leaks or seeps water like a dishwasher or a poorly connected garbage disposal. If we find the growth began inside a wall or a crawlspace, then the source is more likely a leak in the roof or an outside wall that allows water into the home. SERVPRO technicians are trained to find and repair these leaks if they are minor. After stopping the water, we spray anti-microbial agents on all visible mold. These chemicals kill mold on contact, making it harmless once more. If the mold has had enough time to extend hyphae into building material like drywall, we remove what is now a food source. 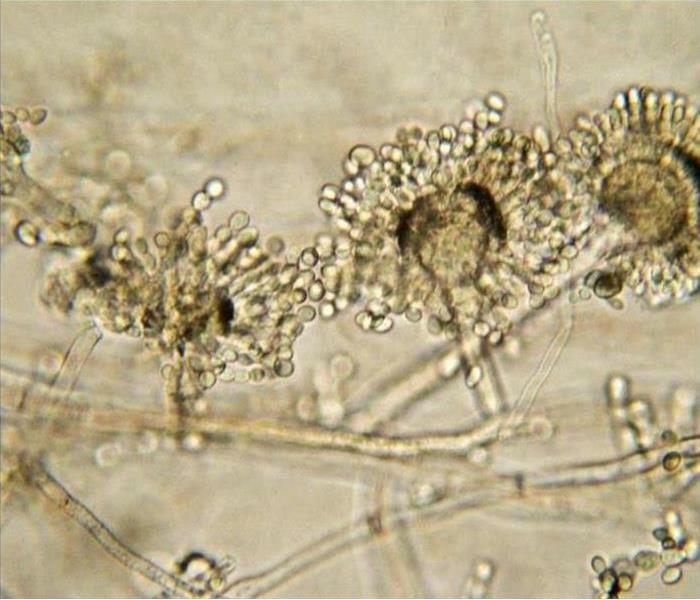 Hyphae look like roots and serve the same purpose for mold: Search for food. These mold extensions quickly burrow into drywall and other natural fibers like cotton and wool. Some spores even feed on home insulation. Since many of these building materials are difficult to clean, it is often cheaper to replace infested material than to try and clean it. SERVPRO of Nampa / Caldwell has removed and remediated mold damage for Idaho residents over the last twenty years. For more information about what SERVPRO can do to help you return your home to safe, dry environment, call us today at (208) 466-5000. We are here for you. Click here for more about this town. Fire damage infiltrates your entire home. Call SERVPRO for help fixing any fire damage in your home. Whenever something burns inside your Nampa townhome, the heat and the flames might not be the biggest problem. In many cases, fire odor damage becomes a more significant portion of the mitigation project than the removal of burnt materials. Smoke coming from a fire can cause many issues even in rooms far away from the source. 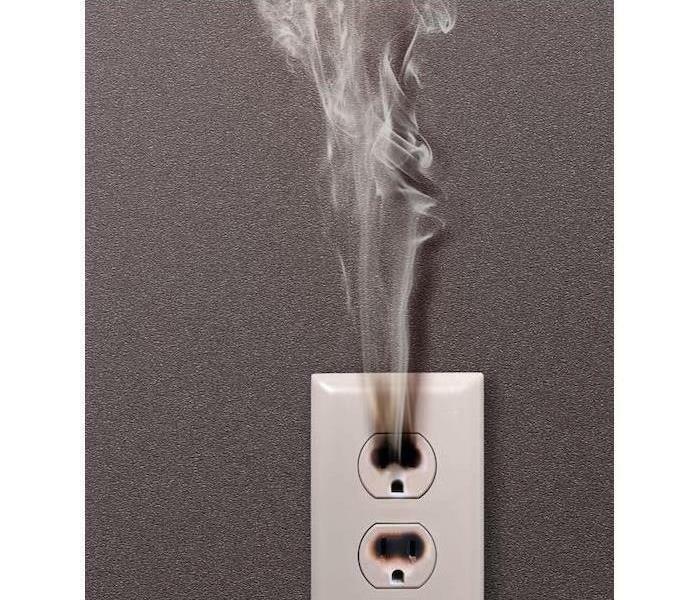 Smoke can cause soot residues to develop on surfaces inside your home and create unpleasant aromas. In some cases, further steps must be taken to mitigate your fire odor damage even after all soot residues and soils get cleaned and removed. Whenever removing odors from a building, our SERVPRO technicians utilize various types of equipment. When restoring fire odor damage in Nampa, we utilize chemicals and techniques that either mask or neutralize malodor particles. Masking occurs when more pleasant aromas are put into the environment in an attempt to cover up burnt smells. Other deodorization techniques use chemicals or ozone particles to pair with and chemically neutralize the malodor particles. The idea when using masking or pairing agents is to break chemicals down into microscopic particles that mimic the way the smoke moved through your townhouse. Fogging methods such as using an ultra-low volume fogger breaks down the chemicals into tiny particles in the form of a fog. The deodorant fog can then penetrate deep into porous materials like fabrics. In more severe situations, our SERVPRO technicians can implement thermal fogging equipment. Thermal foggers heat the chemicals and break them down into even smaller microscopic particles. Thermal fogging does the best job of mimicking smoke behavior due to the heat applied during the process. Another method used when deodorizing a building, is setting up an ozone machine. Ozone generators send unstable O3 molecules into the air. The extra oxygen atom in the O3 compound attaches to malodor particles and oxides them making them neutral thus removing burnt aromas. If you ever notice any types of foul smells after something burns inside your home, call SERVPRO of Nampa / Caldwell at (208) 466-5000 seven days a week. Icicles are often an indicator of ice dams forming. When the weather is at its coldest, heat can cause unexpected problems in your home. Prevention is your best bet, but not every obstacle can be avoided. When heat from inside your home leaks out and causes snow and ice to melt and run down the roof, it may refreeze as an ice dam. Keep an eye out for telltale indicators like icicles on the soffits, particularly if they look dirty. 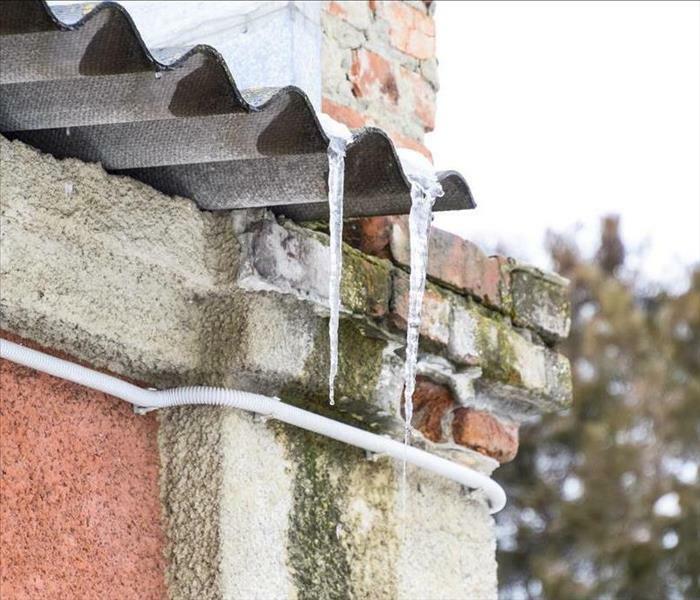 Seeing water and ice behind your gutters can also help you identify a potential issue. 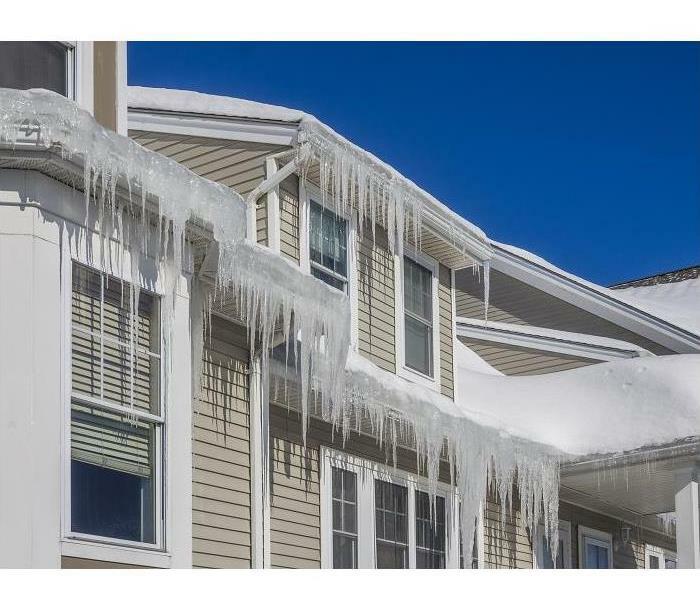 If you find signs of ice dam related problems SERVPRO can help you assess and remediate damages. It can be an issue of too little insulation, or other hidden roof damage letting warmth out. Ice damming can cause many problems for Nampa homeowners. Water pooling behind the dam can force its way inside your home. Regardless of whether the problem is water stains and removal in the attic or seepage in the siding our technicians come prepared to remedy the situation. Other secondary issues from the water damage can crop up unseen. Mold in the insulation or structural damages from frozen pipes can create the need to remove, replace or even demolish damaged areas. SERVPRO specialists can help quickly mitigate these dangerous conditions and get you back in control of your property. We look deeper and take the time to find hidden pockets of moisture that can cause ongoing damage and odors. Our dedicated staff can handle deodorizing along with all your other needs so that you can get back to feeling cozy right away. 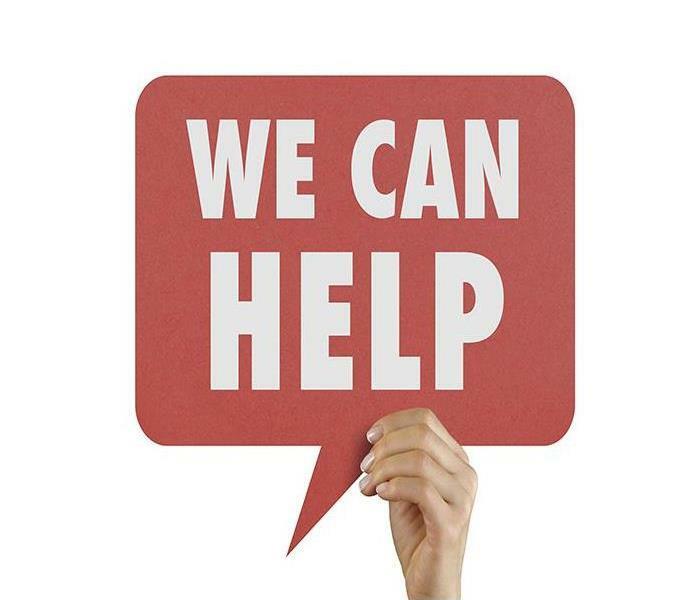 When you need someone to help get you out of a chilling situation, call SERVPRO of Nampa/Caldwell. We are available 24 hours a day at (208) 466-5000. Click here to read more about Nampa. Give our SERVPRO of Nampa / Caldwell professionals a call today at (208) 466-5000. While many might recognize the need for professional cleaning or restoration after a disaster or emergency has damaged their Nampa office building, that same level of care and consideration can go into ongoing scheduled cleanup and upkeep for your facility as well. Our professionals have unique training and equipment designed to improve the efficiency of our restoration work, and these same tools can prove instrumental in keeping your business in top form. While there are many facets to examine when it comes to cleaning your Nampa office building, there are some areas of this upkeep that could benefit from our advanced techniques and equipment. While you no doubt have a custodial staff on hand to contend with small spills and general cleaning duties, our SERVPRO team can offer efficient and effective cleaning ranging from your carpets to your HVAC system. Carpet cleaning is often one of the most sought after cleaning services that we provide because it does not take long for this flooring in your facility to get soiled and compromised. Even with regular vacuuming and spot cleaning, the fibers of the carpet can still act as a magnet for debris, dust, contaminants, germs, and other particulates. The only effective method of cleaning these areas is through penetrative machines like steam cleaners and dry cleaning efforts. In the same way, our SERVPRO team can offer this same type of dry cleaning to restore the appearance and vibrancy of office furniture, drapery, and other fabrics that make up the décor of the office space. Our services can even get scheduled around your operating hours so that our efforts do not intrude on your productivity. You can secure our services on an as-needed basis or as an ongoing scheduled upkeep routine depending on the needs of your facility. While many consider restoration companies to be vital after an emergency has occurred, many can also benefit from the same cleaning and professional result of our training and advanced equipment to maintain the appearance of their business. Give our SERVPRO of Nampa / Caldwell professionals a call today at (208) 466-5000. We have the right tools to remove ice preventing further buildup after a flood. Give us a call right away so we can begin prevention and restoration. Can Ice Damming Cause Flooding in Your Nampa Home? Through the harshest points of the winter, the temperature around your Nampa home can drop considerably. Combined with heavier snowfall throughout this season, many homes experience ice damming. With many roofs shingled, ice damming can allow for leaking when a growing dam on the edge of the roof penetrates beneath the shingles and melts. Often this is a result of thawing from warm spots on the roof while the temperature is still well below freezing. The situation is even more critical when the dam becomes large enough to restrict melt off from escaping the roof, and it finds a weak point in the roof to exploit and leaks inside. Preventing a flood from an ice dam in your Nampa home can be as simple as readily checking your roof for signs of buildup. However, without the appropriate tools and safe anchoring, it might prove dangerous to remove ice dams on your own amid freezing temperatures. 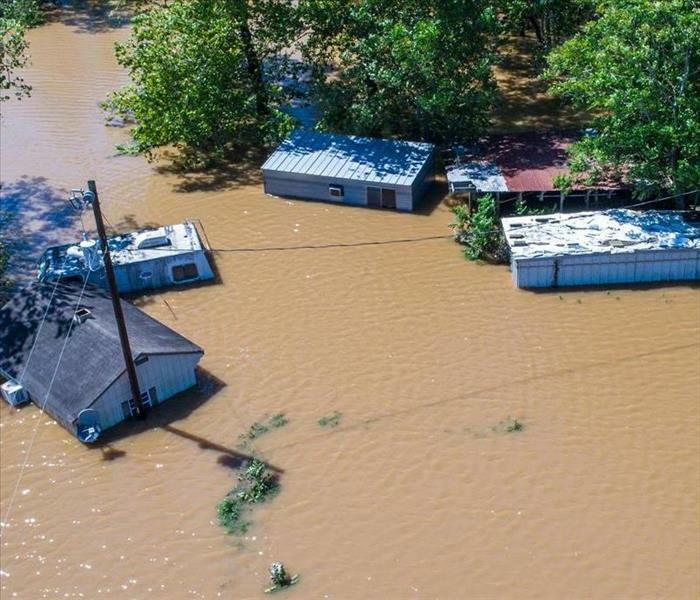 Worse still, many homeowners do not recognize the potential of flooding for their homes until these dams have already allowed water to begin flowing into the home unabated. While this might be a finite amount of flow, depending on the buildup on the roof, it can still spread quickly causing considerable damage to the attic and floors below. Our SERVPRO rapid response team can arrive quickly to help mitigate your loss in this situation and offer effective solutions for drying and extraction. One of the most severe concerns for the attic space is further penetration and mold production, as your attic is often one of the warmest areas of the house. Drying out the flood damage is vital to prevent the colonization of mold, and our SERVPRO team can also identify water penetration points and seal over these areas to prevent further flow. While ice damming continues to be a problem for many homes throughout the winter season, many homeowners learn about this phenomenon when flooding has already affected their property. Let our SERVPRO of Nampa / Caldwell team clean up the mess and dry up the damage. Give us a call 24/7 at (208) 466-5000. You haven't experienced Nampa until you've seen Downtown Nampa! Click here for more details. Call your SERVPRO Franchise professionals to remediate mold damage in your home. Your Nampa home protects you and your family from the outside world, and you want to ensure that it stays protected from anything that can bring harm to it, as well. Microbes live everywhere, although in small numbers. Once microbes multiply, they can cause your home in Nampa to require mold remediation specialists like the ones from SERVPRO Franchise professionals. We take our IICRC-certification seriously, as well as the way we provide services to our customers. We always take pride in our work, how we communicate with those who rely on our expertise, and our ability to make things “Like it never even happened. " When we receive a call from a homeowner requesting mold remediation, we ensure that our tools, supplies, and equipment all are ready for the work ahead. Our Green Fleet stays loaded with the basics needed for the majority of mitigation, remediation, and restoration work, so we have very little to do before we leave our facility. We are always Faster To Any Size Disaster, and mold growing in your home, out of control, ruing your belongings, can become a disaster quickly. We combat mold in ways that it cannot work around. We contain it with both barriers and filters and remove it so it cannot grow elsewhere. Plastic barriers that work to suction spores out of the area keep it from spreading to other areas of your home. Using dry ice pellets kills it by freezing it, and our liquid antimicrobial agents crush it as it dries, keeping it from ever becoming a problem for you or anyone else ever again. These are only a few of the ways we perform remediation of mold and mildew infestations. Sometimes, cleaning with a damp cloth removes microbes adequately from hard, non-porous surfaces. Damp cloth and ultrasonic cleaning can bring mold-covered items back from certain disposal in the garbage. Learning the most effective methods during our training means we can save more of your home and more of your belongings when mold and mildew try to take over. When you find mold in your home, call us, SERVPRO of Nampa / Caldwell, at (208) 466-5000. We can help make your home a less inviting place to pesky microbes, and make things more hospitable for you and your family. 3/22/2019 - Are Waterborne Pathogens A Concern After Water Removal In Nampa?